Oftentimes, when determining what content management system will power a website, clients lose track of just who will be using the platform the most. Sure, there are initial technical requirements that must be considered. What technology stack will the system utilize? What are the security considerations? What is the website’s technical functionality? But often, we are overlooking who owns the website internally. In the beginning days of the internet, the website was almost always a static brochure site, owned by the IT department of a company. Even today we see this is the case with many new clients who come to us seeking redesign and redevelopment. Over time, IT gave way to marketing and sales, who realized that their website wasn’t just a brochure but actually the most important component of their job, providing potential customers with a 24/7/365 resource to aid in their buying decisions. This fundamental shift led to the advent of the content management system. These systems allowed marketers to take control back from IT. It allowed them to manage the day-to-day content on their schedule, without waiting for technical assistance. And as time went on, the CMS systems available got smarter, integrating into sales and marketing technologies such as Salesforce and Hubspot. So what is the best CMS for marketers today? The answer is… It depends! Marketers have to carefully consider the functionality they expect for their content management system. They have to figure out what system will allow them to accomplish their workflows, all from one universal platform. You’d think this should be the first concern, right? If a CMS doesn’t allow you to control at least 99% of the content yourself, then you are in a bad relationship with your system. It’s time to break up! The best CMS for marketers should allow them to perform their most frequent tasks on their own. This means the creation of pages for current initiatives and the ability to edit forms for user identification. It should allow you to manage all media including the scheduling of content posts and version control so you can roll back if necessary. And most of all, it should be assembled so the taxonomy of your website matches what’s in your administrative portal. When you “hack” your CMS to handle the different content areas of your site, you are creating workflows that are not consistent, nor built for the long term. All marketers that take digital mediums seriously are using MarTech, or marketing technologies. This means, they understand the value of marketing automation and are using platforms such as HubSpot, Eloqua, Marketo, Pardot, Infusionsoft, or similar. But using a marketing platform isn’t enough. Having a CMS that allows you to tightly integrate your experience with these platforms is essential. This means seamless backend integration to your forms, for example. If your CMS only allows you to embed a form from these technologies but doesn’t allow you to integrate via an API connection, then you need to consider a better solution – immediately! While marketers are relying on MarTech systems and other platforms to aid in their day-to-day work, we believe the CMS of the future must include more tools in one spot. This means integrations to the 80% of stats you care about on a regular basis, in one place. Consider if your CMS allows easy access to the stats you rely on; traffic and visitors, pages and content, leads, lead activity, and so on. Imagine logging into one place each day to manage your content and see an overview of your marketing operations… It is a game changer for your day-to-day efforts. There is no way a CMS can be best for the marketer if it doesn’t involve some level of lead generation management. This is an area where a custom CMS application can really aid and assist the daily marketing efforts of an organization. If your business runs a high-traffic website with a large amount of lead generation, custom solutions can streamline your lead management and segmentation efforts significantly. An example where a custom CMS is helpful in this area is lead cleaning and filtering. Custom systems can integrate with third-party applications that can score user submissions such as email and phone numbers for legitimacy. There are even providers who can determine if a phone number submission is a mobile or landline phone, which is important for lead generation teams who have call centers (the legality of calling mobile phones varies in different states). Another aspect of lead generation is security. Does your CMS properly secure the data you are gathering? This is especially important in the area of healthcare, where regulations such as HIPPA may come into play. 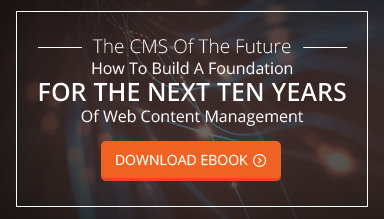 Off-the-shelf CMS solutions may not aid in your marketing efforts in this area, and may not be capable of the security hardening your business requires. Finally, don’t forget about scalability in terms of lead generation. We’ve seen websites with hundreds of thousands of leads which had to be searched, filtered and otherwise manipulated for business reasons. The off-the-shelf platforms will have a hard time managing this amount of data as many will be based on older database platforms. This is a consideration you should keep at top of mind while you contemplate what the best CMS platform is for your marketing team. Why we even have to mention the importance of SEO in 2016 is beyond me! SEO is essential to your marketing efforts! And to be called the “best CMS for marketers” any system must have proper SEO management including not just metadata like keywords, titles and etc. but also integrations to webmaster tools for Google. Additionally, your CMS should have the ability to change other things such as redirects and robots.txt files. Yoast does a good job of this for WordPress platforms. While it would be nice for a CMS to handle this functionality without the use of a paid plugin, Yoast is a comprehensive tool that offers many benefits to marketers. But, I want to look at SEO from a workflow perspective. The most common issue we see with marketers and their SEO consultant is a disconnect between teams. All too often we see SEO consultants login to a website, make a significant change and not inform anyone, which later could result in all sorts of problems. Yoast, for example, integrates directly into posts and pages in WordPress, which means it’s essentially part of the platform. The CMS of the future needs to better separate the ability of the SEO consultant from the other members of the team by providing a split interface, limiting their permissions and potential for technical errors that can happen. Right now, integrated systems are weak in this area, but there is a capability for custom platforms to allow this separation to happen. Marketers are budget conscious. This means, planning for unknowns comes foreign to them. Marketers are typically set in their mind as to what their efforts will include for the next period of time, whether it be months or a year. They plan out trade shows, publications, ad buys, SEO budgets… Now that they are in charge of technology, however, the possibility of unknown technical challenges presents itself as a real concern. Because the majority of CMS platforms require constant updates due to security concerns or functionality changes, planning budgets for technology is very difficult, especially for those without the technical background that is required to understand the scenarios that can happen. The best way to plan is to set aside a budget for maintenance to cover unknowns. The second best way is to invest in a platform that can actually weather the storms of unknowns that come around. Our current belief is that decoupled CMS platforms can enable marketers to have a set technology stack for a minimum of five years. Not bad! Now that you’ve learned the top factors that need to be considered for a CMS platform that will benefit marketers and your business, we hope that you’ll be able to explore your options further. In order to have the best CMS, you need to understand what its features are and how it works. We hope you’ll continue to do your research and keep learning about the CMS platform that will make a positive impact on your daily operations.